When I looked at WH Smith last year I was surprised to find a high growth company. The impression I get from its high street stores is of a “stalwart”; a very mature business in a mature industry which is, if anything, being squeezed by the world of online retail. That image is largely correct, but it ignores the best part of WH Smith – its passenger-facing business. If you have been anywhere near a train station or airport in the last decade there’s a good chance you have seen one of WH Smith’s “Travel” retail units. Just as you’re about to metaphorically leap onto a train or plane you realise you need something to eat/drink/read. Never fear, WH Smith is there to help you (and in many cases it will be WH Smith and nobody else, as frequently there is only space available for one retail unit). With such a captive audience and a lack of competition, prices and profit margins can be higher than is possible on the high street. Also, given the deliberate sameness of international airports, this travel side of the business is far easier to take international, which is precisely how WH Smith intends to grow. Thanks to these attractive features the travel side of the business has, for some years, been the company’s major source of profits. I don’t think it will be long before it is the major source of revenue as well. The other side of WH Smith’s business is its traditional high street stores. This business is in long-term decline, or at least is shrinking to whatever size is possible in the modern world. When I was young I would buy records from WH Smith, but of course that side of things has long since gone the way of the Dodo. Books, of course, are another example of a traditional WH Smith product which is suited to online retail. The writing is clearly on the wall: There will always be a place for a convenient shop on the high street, but it will be a smaller place than in the past. 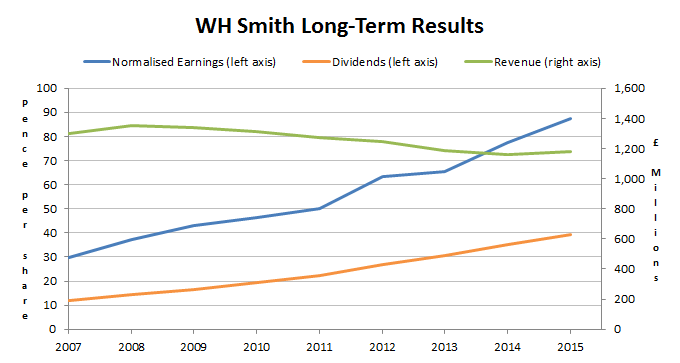 Richard Beddard at Interactive Investor recently wrote a short review of WH Smith where he kindly summarised and compared the performances of these two sides of WH Smith over the last few years. The consistent shrinkage of the high street business’s revenue is clear. However, what is more interesting (and perhaps even astonishing) is the fact that the company has grown its high street profits, even as revenues have fallen. A manic focus on cost-cutting and efficiency are probably the main reason for that, but profit margins can only be increased so far, and at some point if revenues continue to shrink they must inevitably lead to shrinking profits, at least on the high street side of the business. I think this chart of long-term results helps to clarify the situation. Revenues are declining, but the rate of decline is dropping off and may even have turned. This is what I would expect as the growth of travel revenues eventually overcomes the decline in high street revenues. In contrast to declining revenues, both profits and dividends have been increasing very rapidly, with earnings going up at an unlikely to be sustained 13% per year. So the company has above growth (both in terms of speed and consistency), above average profitability and almost no debt. In short, it has produced exactly the sort of results I like to see; but what about the share price? On each of those multiples WH Smith comes out as more expensive, but that isn’t necessarily a bad thing. As a growth company I would expect the shares to trade on higher valuations and with a lower dividend yield. 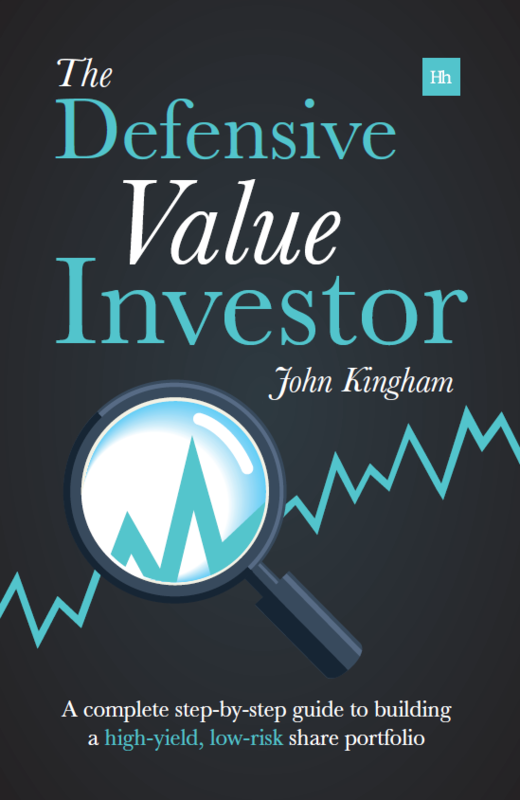 Is the combination of its fundamental factors (Growth Rate, Growth Quality and so on) and its valuation factors (dividend yield and PE10 primarily) attractive relative to both the overall market (the FTSE 100) and other companies that you or I might choose to invest in instead? The answer, in short, is: Not particularly. My stock screen ranks around 230 stocks using those fundamental and valuation factors, and WH Smith is the 110th highest ranking stock. That is almost bang on the middle rank of 115, which I interpret as “fair value”. In other words, my screen is telling me that WH Smith is quite likely to be correctly valued by the market and therefore it should not be expected to outperform in the medium-term. Of course you have to remember that the market is a chaotic and random place (in the mathematical sense of those terms) and so WH Smith’s shares could double or halve in the next year; there is simply no way to know for sure. What my screen is suggesting is that, on balance, there is no good reason to expect outperformance and therefore, in my opinion, no obvious reason to invest at today’s price. Generally I don’t like to invest in stocks that are outside of my top-50 ranked stocks. For WH Smith to reach that elite group it would have to maintain its current excellent record of fundamental growth and at the same time see its share price fall from 1,700p to around 1,250p. That’s a drop of over 26%, which sounds like a lot, but in reality it isn’t. In a world where Rolls-Royce drops by more than 40% in just over a year and a half, anything is possible. However, even though WH Smith has the sort of performance I like to see, it has a significant but relatively hidden danger – its defined benefit pension scheme. Although the scheme was closed in 2007 the company is still legally obliged to pay out the retirement benefits that employees had built up to that point. The problem is the size of the obligations. At £932m, the scheme’s obligations are far greater than the £87m the company has earned, on average, in recent years; more than ten times greater in fact. That is simply too much for me and represents a significant risk to the company’s future cash flows. Currently the scheme is in surplus (its assets are greater than its obligations) but the company is still having to plough around £13m a year into the scheme as part of a deficit recovery plan launched several years ago. 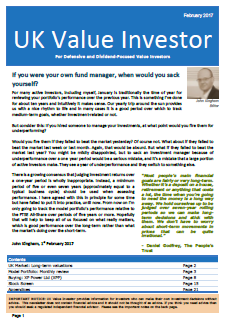 The risk is that if investment values decline the scheme could be left with a pension deficit of several hundred million pounds. Recovering from that situation could take many years and have a massively negative impact on cash flows and the company’s future prospects. Whether the pension scheme becomes a problem or not is unknowable, but the risk is there. The pension issue is why I have not bitten the WHSmith apple… It’s annoying because I like the company and I do believe the travel side will continue to drive further profits year after year, but are they enough to sort out the almost £1bn in legal pension obligations? Nope! I’m glad you picked up on the pension. Most investors just seem to look at the pension deficit/surplus position rather than the overall obligation, but those obligations effectively set the size of the deficit if things go wrong, and currently the obligations are pretty huge (and growing). It looks like the pension problem is endemic in many companies in the FTSE100 and beyond. If the relative size of the fund, is as in this example in many of these companies, and inflation stays muted for a lot longer, the deficits are going to be growing. It’s scary but it could depress the whole market. It’s a small sphere, but I’m focussing my attention on companies with lots of cash, very little debt or no borrowings and the ability to fund a sensible and in some cases aggressive R&D budget for products that are needed (often well patented), widely adopted across a range of industries (not limiting exposure to just one sector ) and offer high profit margins and command customer loyalty. Renishaw is one of these beasts. Hi LR, that sounds like a sensible set of criteria. Renishaw is one of my top-50 ranked stocks, so at face value it looks pretty good, although I haven’t looked at it in detail at all. It’s very much a growth stock rather than an income stock, although as long as the price is right that shouldn’t matter too much. I agree the shares are on the ‘overvalued’ given EPS growth is lower than P/E, but I would love to see the company’s stock valuation/EV vs. the company’s EPS to visualise how overvalued WH is. HI Walter, thanks. Unfortunately I don’t use Enterprise Value to measure companies so I have no idea about where WH Smith stands relative to that metric.